So, the bride has named the big day and is focused on organising the perfect wedding which means looking at designer wedding dresses to ensure she looks fantastic. With so much work to do, many brides will place the selecting of their wedding dress at the top of their to do list because it will, undoubtedly, be the centre of attention and will need to make the bride look and feel fantastic. It's also, and there's no getting away from this, necessary to look right because it will feature in the bride's wedding album which will be seen by many people over the years to come. 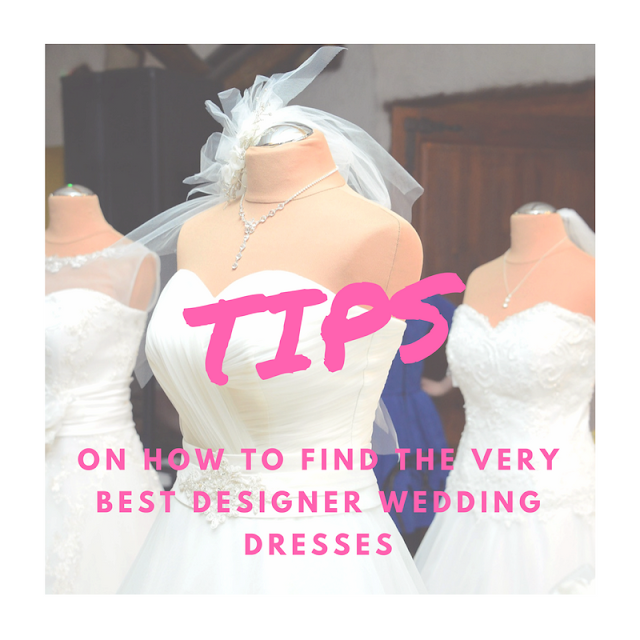 So, these are a few tips for the bride looking at designer wedding dresses and the first is to appreciate that bridal gowns come in a variety of sizes and shapes. The bride will also need to understand that wedding dresses will reflect seasonal trends and there's been a large growth in bridal wear design in recent years. The first step is to appreciate what's on offer in the bridal market and then look more closely at several wedding dress designers to understand their offerings and why the special dress is worth the money for a special day. Some research will be key beforehand which means checking out websites and magazines and then arranging to visit bridal boutiques and take on board expert advice from the owner and the experienced boutique assistants. The bride will also need to appreciate which silhouette will best suit their body shape so that they get to flatter their figure though any will find they will look great in ballgowns, unless they are very petite, and most body shapes will suit A-line gowns. The secret when looking for wedding dresses is that the bride needs to feel comfortable and not self-conscious while wearing the dress and they need to appreciate they will be wearing it for several hours. Indeed, the bride should not be misled by friends or family about buying a dress they do not like. Another overlooked issue when the search for wedding dresses begins is to set a budget not just for the dress but also for the entire outfit; the bride will need to buy a bouquet, shoes, jewellery as well as a veil. These could add substantially to the wedding dress cost. For this reason, brides need to be realistic with their budget and look for cheaper designer wedding dresses so they can afford the stylish accessories that need to go with it. There's no point in spending more money on an expensive wedding dress and then having to cut back on the extras. Finally, the search for designer wedding dresses is about delivering the bride’s dream dress so while they need to listen to the opinions of those they go to the boutique with, it's important that their own opinion is the loudest one heard so they fall in love with a dress that makes them happy and comfortable.